The NCDIR currently has over 60 active collaborations from over 40 institutions. If you are a scientist seeking in-depth training, typically we ask that you seek to collaborate with one of our scientists, and then visit one of the labs on a longer-term basis (i.e. several months). Our Center places great value in scientists training scientists and this training provides direct scientist-to-scientist training for trainees who want to learn and/or apply a tool (method, technology) to their own science. If you are interested in collaborating with one of our researchers, visit our About Us page and contact us directly or fill out the Contact Us form! The NCDIR Fellows program provides is awarded to an exceptional scientist within the NCDIR, allowing them the opportunity to receive hands-on training in a specific research, technology, method or computational tool to help further their own research. We have leveraged the framework of the Fellows program from within the NCDIR to trainees in the greater biomedical community. The 2018 Fellow was Maxwell Neal, a postdoctoral fellow in John Aitchison’s lab (CGIDR). Within the Aitchison lab he worked on characterizing the functional role of the nucleoprin NUP170 in yeast. He also collaborated with members of Alexis Kaushansky’s lab to identify the determinants of hepatocyte susceptibility to infection by Plasmodium. He also collaborated with researchers at the University of Washington who focus on developing community standards for sharing computational, mechanistic models among biomedical researchers. A computational biologist by training, Dr. Neal’s work focused on applying computational analyses to assist in various ongoing investigations within the NCDIR consortium. Working with members of the Aitchison lab, he developed an approach for functionally characterizing the NUP170 protein using a previously-published compendium of yeast transcriptome profiles assembled from over 1400 single-gene knock-out strains. By identifying the set of knock-out profiles that best match the NUP170 profile, Dr. Neal identified a set of putative functions associated with NUP170 along with a set of genes that may interact with NUP170 as participants in those functions. By cross-referencing Dr. Neal’s gene set with NUP170 protein-interaction data collected in the lab, we have been able to identify specific protein complexes that may participate with NUP170 in maintaining genome stability. Dr. Neal has also been responsible for analyzing RNA-seq data generated as part of the NUP170 project. These analyses helped identify the region of the NUP170 protein required for its subtelomeric gene silencing activity. In collaboration with the Kaushansky lab, Dr. Neal has developed computational methods for determining how specific Ephrin receptors modulate hepatocyte infectivity by the malaria parasite. Using flow cytometry data collected by last year’s NCDIR Fellow Adam Lewis, Dr. Neal developed computational approaches for visualizing how infectivity changes with receptor amount and for determining the relative contribution of different Ephrin receptors (and their associated hetero- and homo-dimers) to infectivity. In addressing the latter challenge, Dr. Neal developed a mechanistic model of Ephrin receptor dimerization on the cell surface. Then, using a genetic algorithm, he identified the linear weighting factors for each Ephrin species that produced the best fit between model-based infectivity estimates and actual infectivity measured using flow cytometry. The resulting model not only shows good quantitative matches with data in terms of its infection rates, but also predicts a counter-intuitive biological finding – that adding receptor ligand to cell cultures increases infectivity. 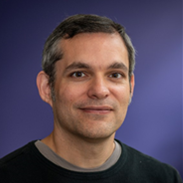 As an NCDIR Fellow, Dr. Neal also collaborated with researchers at the University of Washington who focus on developing community standards for sharing and reusing computational models within biological research. Specifically, these researchers investigate the application of semantic annotations on computational models. Such annotations capture, in a computable way, the biological processes simulated in a model as well as the entities that participate in those processes. Semantic annotations are a critical ingredient for making models more discoverable and reusable among the broader scientific community, and with assistance from the NCDIR Fellowship program, Dr. Neal published two papers in 2018 focused on semantic annotations for computational models.